With the Kontour K1C Dynamic Height-Adjustable Column Dual Monitor Mount from Chief, you can mount dual 10 to 30" monitors right to your desktop. This mount features a sturdy steel construction capable of supporting up to 50 lb (two 25 lb monitors) and can be mounted to the desktop, through a standard grommet hole, or through a bolt hole with the included kit. Once installed, the mount offers a dynamic height adjustment range of up to 13", a maximum extension range of up to 20.6", and features 100 x 100mm and 75 x 75mm VESA hole configurations. 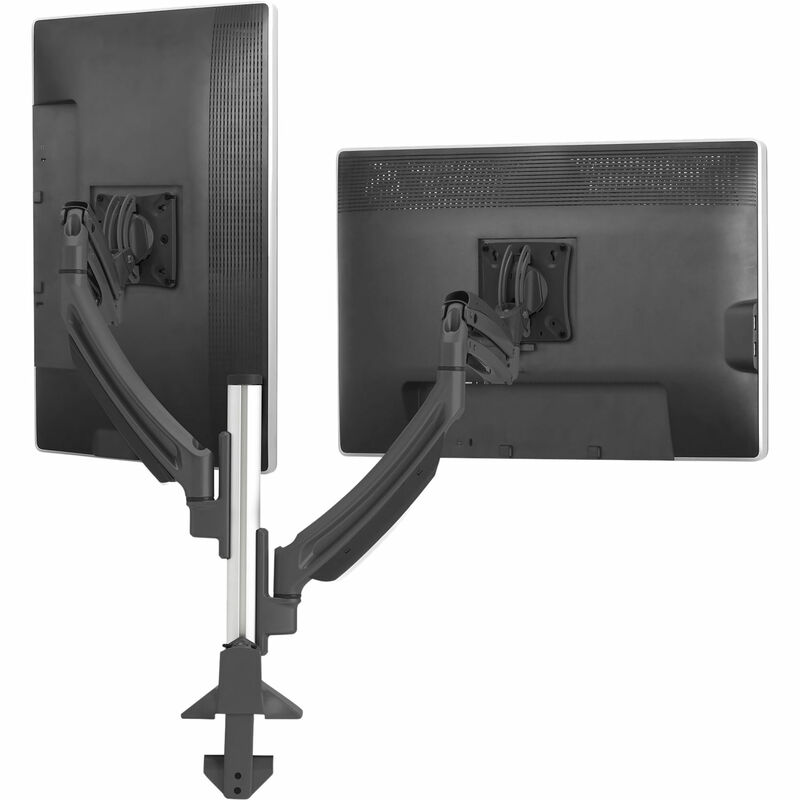 Additionally, each monitor attached to the mount can be tilted from -10 to 75° for maximum viewing comfort. Box Dimensions (LxWxH) 36.5 x 11.5 x 10.3"
Kontour K1C Dynamic Height-Adjustable Column Dual Monitor Mount (Black) is rated 4.3 out of 5 by 4. Rated 2 out of 5 by PeripheralConnoisseur from So close yet so far On paper, this mount is perfect. It has a wide range of adjustability, and each arm can supposedly support 25 pounds. Upon receiving the unit, I was greeted with some minor shipping damage crack in plastic cable management cover. It wasn't a dealbreaker, so I went ahead and installed the arms and the VESA brackets on my monitors. This unit feels rather solid up until the junction of the monitor arm and VESA mount. It seems that the engineers at Chief made some poor decisions at this point. With a heavy monitor like my 20 pound Dell u3011, there is a lot of stress placed on this joint, and the materials they are using are not strong enough in certain positions. Disappointingly, the included VESA mounting plates are plastic and the joint seems to be made of a combination of plastic, aluminum, and perhaps thin steel. This joint flexes under the weight of my dell monitor, and the monitor will not lie flat if I configure my u3011 for a standing workstation. I have an ASUS monitor mounted on the other arm, and since it is a much lighter unit, everything works as expected. But even with the ASUS, any adjustments made using the arm/monitor joint cause an audible creaking sound and the feel of the movement is rough/does not exude quality. I think Chief has great potential with this unit, but they should, at minimum, lower the advertised maximum weight per arm until they have a chance to redesign the arm/monitor joint. Rated 5 out of 5 by Robert from Sturdy and Smart Design Cable management is thoughtful and reduces visual clutter, the arms are sturdy and allow movement in all directions. I can get my two u2415 Dell ultrasharp monitors side by side however I need. Very satisfied with the purchase. Rated 5 out of 5 by Anonymous from Excellent. Two 27 inch monitors can be displayed many ways This mount holds my two 27 inch, 11 pound monitors. It is the only mount that can hold them side by side or one of top of the other. The monitors can be horizontal and/or vertical. It looks like it can hold monitors even bigger than mine. It is also possible to add two more arms. I am constantly adjusting my monitors' positions and this can be done with very little effort. There is a screw that can be used to adjust to amount of force required to move the arm. It took a few minutes to get it right but, after I did, the monitors move easily and stay in place. This mount seems very well built. The only weakness are the plastic cable holders. They look like they will not last forever. The instructions were a little confusing but installation was easy once I figured out what actually must be done. To install into a desk simply drill a hole with a 3/8 inch bit, then attach the pieces. I drilled holes of varying sizes into a piece of scrap wood. The recommended 3/8 bit was definitely the best fit. If you are going to drill a hold to attach this to a desk I strongly recommend carefully considering where the hole will go. I experimented by holding the mount in several positions and picked an off center, slightly unexpected place for it. My monitors can now be moved to positions that are comfortable for me to view, which would not have happened had I not done a little thinking before drilling the hole. I am not a paid reviewer nor have any connection to B&H or the mount's manufacturer. I just really, really like it.